My kiddos LOVE LOVE LOVE Quizlet Live. I’m not as enthusiastic. It is fun and students are engaged but if they’re just matching Spanish words with their English translations, they’re not getting filled up with input. 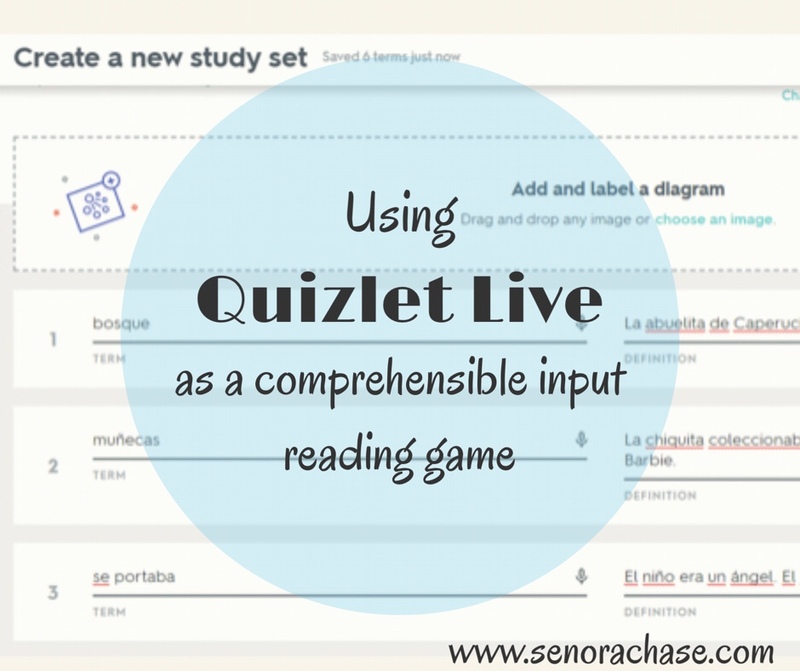 I’ve been playing around with how to make Quizlet Live an input/ reading game. Here’s what I’ve come up with. If you’re brand new to Quizlet, here’s a little intro video (not mine!) of the nuts and bolts of Quizlet Live. Cake Today is my birthday and I am excited to eat ____________________. Water After running, it is important to drink a lot of ____________________. Breakfast In the morning, Mrs. Chase loves to eat bacon and eggs for _. Type up your clues so they’re nice and comprehensible and focus on the words you want them to get more reps of. Be careful that there’s only one possible word that will fit with each clue. To play: Click the magic “Quizlet Live” button on your screen in front of your class. Students will go to https://quizlet.com/live on laptops, tablets or phones and log into the game with the code the teacher projects. It’s important that students type in their real names, as they will have to find each other to form their teams. Sometimes having an alias is fun but not for this game! The sentence will show across the top of their screens and then students will have the individual words on their personal list. It’s great because they’re working together translating and figuring out which word makes sense. And they’ll keep seeing the same sentences over and over! Yes! Comprehensible input AND Repetitions! Whoo Hooo! Who wins? : Quizlet will put students in random teams and I like to shuffle the teams often to give them the chance to work with a lot of different students. Every 4 or 5 rounds I shuffle teams and they sit with their new teams. I think the easiest way to keep track of the winners is to assign poker chips to the winners of each round. (Hey, we’re in Nevada!) Although students are playing in teams, everyone is keeping track of their points individually by holding their poker chips. (See this kiddo’s chips he’s lined up below- he’s won 3 rounds so far, but all in different teams) At the end of the game I do my normal routine Stand up if you have at least 1 chip. Stand up if you have 3 or more chips. Stand if you have more than 5 chips…(But if Spanish, obvio) Winners get a stamp on their stamp sheet. Or…I’m sure there are other things to do with Quizlet Live other than matching a word with its translation. Help me brainstorm! ¿Por favor? I have used it to preview vocabulary related to a topic and found that their conversation really changed. They began focusing on roots and endings, making connections with other words, trying to make cognate connections – it is awesome. Oh! I love that!! I’m going to play around with that….and maybe strategies for figuring out new words. Thanks! Welcome to the party! I’m glad you’ve found something useful- here’s to a great year! nice to learn a little more about quizlet i use it alot to study helps alot to thank you.